Pre- and peri-workout nutrition is the one place where even Paleo folks will sometimes give themselves a pass. It’s hard to resist the claims of powders that promise to supercharge your strength levels and deliver the best workout of your life, and even folks who usually stick to whole foods can find themselves loading up on chemicals like dimethylamylamine, tyrosine, and beta-alanine. It’s hard to imagine that Grok had access to those. I tried out their new Raspberry Lemonade flavor. Take a look at my results below. You’ve probably come across the shrieky headlines that associate some pre-workouts with negative and potentially deadly consequences, like a rapid-fire heartbeat and an unsettling “tingly” feeling. 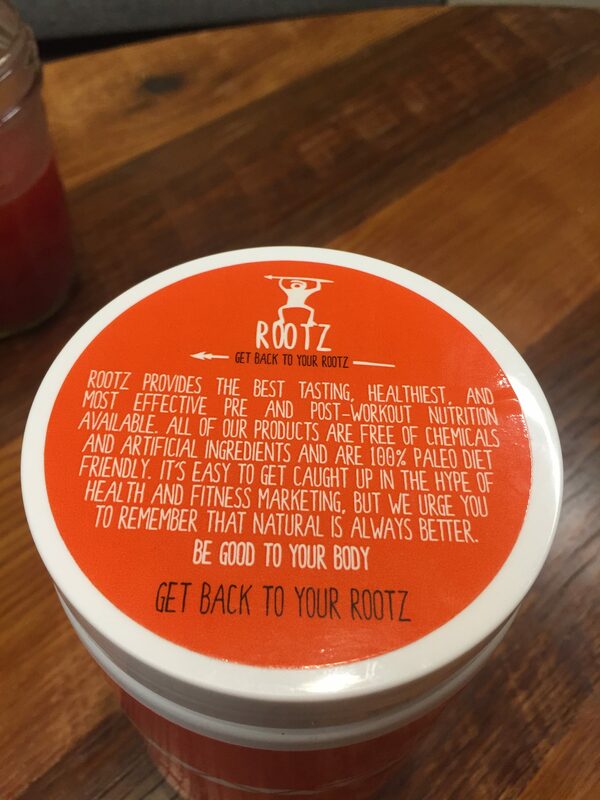 Rootz probably knows that of all legal fitness supplements, pre-workouts come with the most baggage and that a Paleo label could be what’s needed to dismiss those fears. I can see this product as useful not only for lifters who are wary of pre-workouts, but first-time lifters and exercisers who would never think to take one in the first place. The ingredients contain not just plants known for energizing properties, like yerba mate, guarana, ginseng, and Ginko biloba, but also anti-inflammatory compounds from beetroot, turmeric, ginger and cinnamon, plus nutrient-dense ingredients such as blueberry and maca root. This isn’t a huge minus, but it’s worth pointing out that we don’t know exactly how much of each ingredient is in each serving. 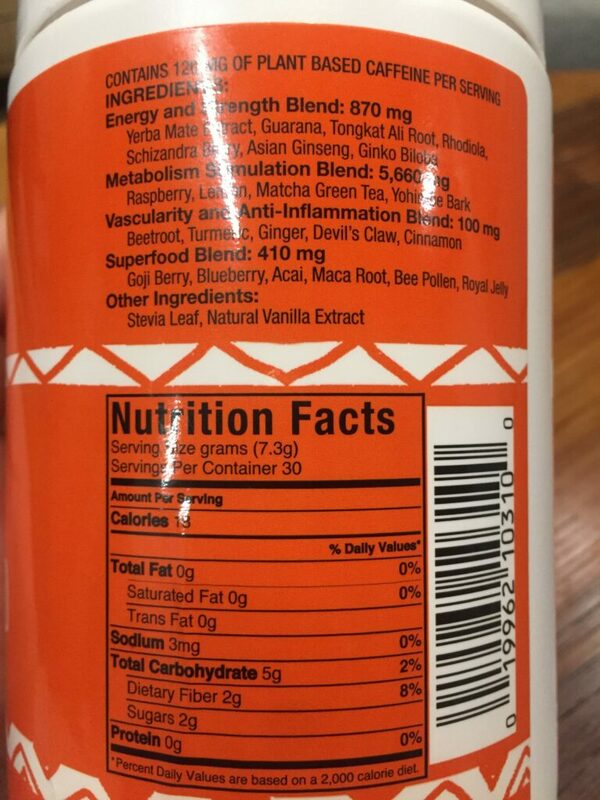 Sure, it might be nice to know there’s powdered blueberry in your pre-workout, but if one serving is 7.3 grams and the final product is one percent blueberry, is there really any point? If your answer is, “Well, it’s one percent that isn’t some weird chemical,” then this is the product for you. The taste could definitely be off-putting for some. If you’ve ever had yerba mate, a earthy South American tea that tastes like condensed green tea, then you have an idea of what this supplement tastes like. Despite the label of “Raspberry Lemonade” and the addition of stevia and vanilla, the finished product winds up tasting like a cup of green tea made with four tea bags and a hint of lemon. If that doesn’t sound so bad, this might be for you. The effect was very subtle, but noticeable. There was no tingly feeling and no enormous rush of energy, despite the fact that a serving contains about 33 percent more caffeine than a cup of coffee. I wasn’t even completely sure that the product was working until I unracked my barbell and started my first working set of front squats: lo and behold, I was able to lift with a little more weight and volume than I had expected to. Again, it’s subtle, but if most pre-workouts put you off, then it’s worth trying out. Paleo anything seldom comes cheap, and it’s no surprise that Rootz is relatively pricy at 30 servings for about 54.99, or ($1.83 per serving). You can compare that to the popular, very not-Paleo pre-workout supplement NO Xplode, two and a half pounds of which is 66 cents per serving. Even when compared to other Paleo pre-workouts, the price is on the higher end. PurePump’s pre-workout is about $1.33 per serving, PaleoPump is $1.66, PureWOD’s costs exactly the same as Rootz, and Natural Force is $2.00 per serve. Then again, of those options, only PureWOD and Natural Force focus as heavily on ingredients like açai and beetroot, so for what Rootz is offering, it’s not too outrageous. It’s probably worth noting that this feeling (like many) isn’t exactly logical: a food that contains chemicals doesn’t have to be unhealthy, and then there’s the obvious fact that cavemen could never find this many internationally-sourced ingredients or process them into a powder. But nutrient density is an important component of a healthy diet, and at this stage in the game, that’s probably the most popular reason for choosing Paleo foods. In that respect, there probably is some benefit in choosing Rootz’ Pre-Workout over your standard pre-workout, since it almost certainly contains more vitamins and minerals. If you feel that your diet should be as nutritionally dense as possible and you’re unsettled by the jittery, chemical-laden effects of popular pre-workouts, it’s a good idea to check out Rootz: just don’t expect identical results.